In Germany, Exchange Your Unwanted Xmas Presents for Books! 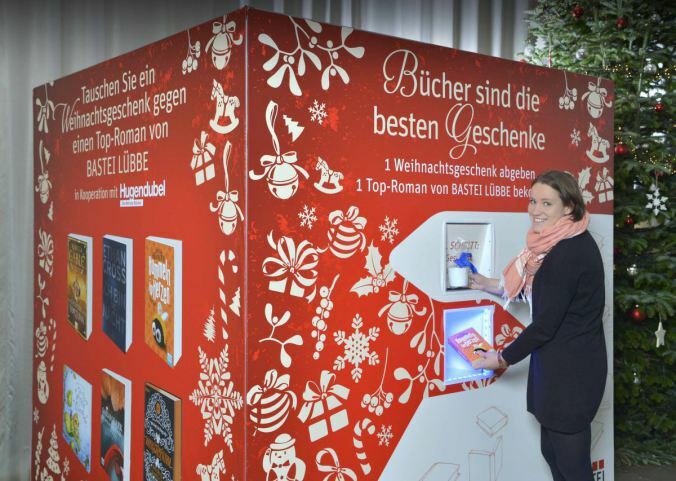 In Germany, publisher Bastei Lübbe and bookseller Hugendubel offer vending machines where you can donate unwanted gifts to charity in exchange for new books. Ah, to be in Germany post Christmas. If you were there, and received Christmas presents that weren’t quite what you were hoping for … all you had to do was find specially set-up vending machines, and you were then able to exchange your unwanted presents (that hideous sweater, that unwanted coffee mug) for BRAND NEW BOOKS! As reported by The Bookseller, the project was started by the German publisher Bastei Lübbe and German bookseller Hugendubel. The machines were set up outside of Hugendubel bookstores throughout Germany: the first one was installed in Munich, with new installations to follow in Ingolstadt and Nuremberg. Bastei Lübbe supplied the books for the program, selecting the seven books that were stocked in the vending machines. Authors included Ethan Cross, as well as popular German historical fiction author Rebecca Gablé. To make the project even better, the donated presents will go to local charities.